Plasmodium, commonly known as the malaria parasite, is a large genus of parasitic protozoa. There are about 200 species. Infection with these protozoans is called malaria, a deadly disease widespread in the tropics. The parasite always has two hosts in its life cycle: a mosquito vector and a vertebrate host. new sporozoites which move to the mosquito's salivary glands, from where they are injected into the mosquito's next host, infecting it and restarting the cycle. The genus Plasmodium was first described in 1885. At least ten species infect humans. Other species infect other animals, including birds, reptiles and rodents, while 29 species infect non-human primates. The Apicomplexa – the phylum to which Plasmodium belongs – are thought to have originated within the Dinoflagellates – a large group of photosynthetic protozoa. The most common forms of human malaria are caused by Plasmodium falciparum, Plasmodium vivax, Plasmodium ovale, and Plasmodium malariae. 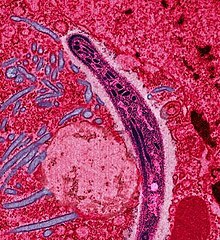 P. falciparum malaria, common in sub-Saharan Africa, is especially dangerous.